Firstly, it was good to hear that Jack Clarke’s recent illness has been diagnosed as a virus and that he is back in light training. Get better soon Jack and I look forward to seeing you back on the pitch. The soap opera of Leeds United reflects my own family, with always something going on. This time it was the news that we had been found guilty of spygate by the EFL and had been fined £200,000. What a load of rubbish, as this ended up out of hand due to lies that were spread. What I want to know, is why Frank Lampard has not been brought up for bringing the game into disrepute for spreading those lies? That isn’t showing goodwill towards us so what is different? The answer is nothing, it’s just that we are called Leeds United and there is one rule for us and one for everyone else. No one will change my mind about that as I’ve seen too much of it sadly and although the club accepted the fine to move on quickly, I would have liked to have seen us fight back for once. Today was a glorious spring day as we headed to Elland Road for an actual Saturday 3pm kick off and another sellout crowd from the home fans. It certainly makes you feel better and blows the clouds away when the weather is nice like this. 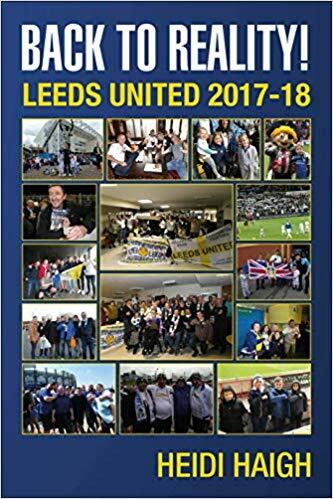 As we’d gone down to third on goal difference due to the postponement of our game, against QPR, my stance is that we should ignore everyone else and concentrate on Leeds United only. Just keep getting the points and see where the land lies later on. It was nice to meet up with some Dublin Whites by Billy’s statue and also in the Peacock and I appreciate the comments made to me. Some Ajax fans were in the Peacock too who had come to watch Leeds and I met a group from Malaysia who had come to Elland Road for the first time as well. Such is the pull of Leeds United; this shows our worldwide support including our Scandinavian contingent who had travelled to the game as well. I’d agreed to meet up with the Nottingham Whites for a photo by Don Revie’s statue before heading into the ground. My granddaughter Laura went in the family stand today with my sister Erica and niece Siobhan and she was looking forward to sitting down! It’s standing room only in the Kop so my granddaughter Alexis who is smaller took on that role today, with some help from my daughter Danielle. The team: Casilla, Ayling, Cooper, Jansson, Klich, Phillips, Bamford, Harrison, Alioski, Roberts and Hernandez. Subs: Dallas for Roberts (81) and Shackleton for Ayling (90+4). Attendance was 34,144 with approx. 500 Bolton fans. Leeds won the game 2-1 with a penalty by Bamford (16) and Alioski (68) with the winner. There was a good atmosphere around the ground as the game kicked off. It was Bolton who came close to scoring in the first few minutes with Casilla making the save before Alioski came close with a shot that was tipped over the bar. As is usual, Bolton were showing that they were going to raise their game as they were playing us. Also with some of the tackles flying in, they were going to play by foul means if they had to. They got away with a yellow card for a couple even though the ref pulled them up for it. As we attacked the South Stand Roberts was brought down for a blatant penalty which was given straight away by the ref. That is only our second one of the season and after a few arguments as to who would be our penalty taker, Bamford stepped up to send the goalie the wrong way to put us into the lead on 16 minutes. As soon as he’d given that decision for us, it seemed that the ref had realised he couldn’t do anything in our favour as every little touch for a while was given as a free kick for Bolton. Casilla had my heart in my mouth a few times as he raced off his line to clear the ball with one coming very close to one of the Bolton players. As it was, Bolton got an equaliser 10 minutes later when we couldn’t clear the ball. Harrison did well to head the ball off the line with Casilla beaten but then we didn’t clear it and after another 3 attempts with the ball running kindly for Bolton, they put the ball into the net. They weren’t going to give up easily that’s for sure. They could have taken the lead not long after this, but luckily the ball went wide of the post. We had a couple of great chances and Bamford’s header didn’t have enough pace on it and was saved by their goalie which was a shame as it was a good move. Their goalie denied us with a great save too so with the scores evens, we went into the break. With the second half underway, some great play saw Ayling get the ball in the penalty area who was unlucky not to score as the ball went past the wrong side of the post. Casilla was called into action again saving a long range shot. As Leeds looked to bring Dallas on as sub, he suddenly was sent to run up and down the line again as Bielsa decided to leave things as they were for a while longer. This paid off as Leeds scored again to retake the lead when Alioski’s cross dipped and their goalie was unable to save it. I haven’t seen it again but it’s been mentioned it was deflected but as long as it’s a goal that’s all that counts. A few minutes later after a bad foul on Alioski, it all kicked off on the touchline and ended up with two of the Bolton players booked and their manager Phil Parkinson sent off. Bielsa walked past the entire melee, went to see that Alioski was okay and was as calm as a cucumber! I think his opposite number should have taken a leaf out of his book! We came close a couple of times but were unable to put some breathing space between the teams and despite Bolton coming close in the last minutes of the game, we were able to see it out and claim the three points. As we ended the first half on the attack, we were awarded a corner but the referee decided to blow the whistle and not let us take it. I’ve mentioned this; because in injury time in the second half we had already played the five minutes plus more and Bolton were awarded a corner. The ref carried on playing until their corner was taken but luckily we headed the ball clear and got the win. With everything the same at the top of the table, we take on QPR next and as usual it won’t be easy as they’ll raise their game no doubt. Just go out there Leeds United and get the three points as that’s all I want!! See you there, LUFC – Marching on Together.